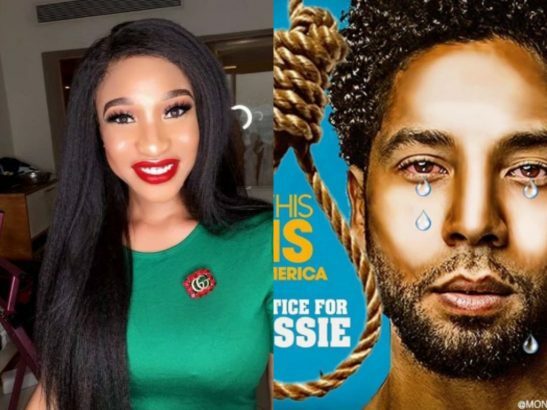 Nollywood actress Tonto Dikeh has shown her support for gay Hollywood actor, Jussie Smollet who was attacked by two men yesterday. According to reports, the “Empire” star had two men chant homophobic slurs at him as they attacked him. In he reaction to the situation, Tonto Dikeh said she stands with him and showered his love and light. Tonto Dikeh, who professes to be a born again Christian, also stated that she sides with the gay actor regardless of what the Bible says about homosexuality. “Sending you Love and Light..
No one shld suffer because they love differently..
AND I ALSO KNOW WHAT THAT SAME BIBLE SAYS ABOUT THE OTHER SINS WE(YOU AND I) COMMIT SHAMELESSLY..
We love you @jussiesmollett ?